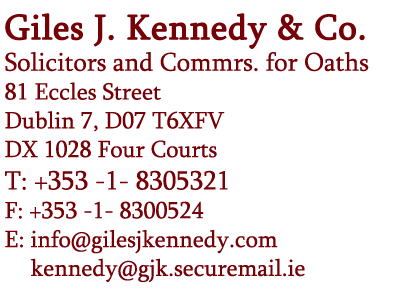 Sean Kenny Solicitor | Giles J. Kennedy & Co.
Sean Kenny qualified as a Solicitor in 1984. Prior to becoming a Partner in Giles J Kennedy & Co. he practised for 20 years as a Sole Practitioner in General Practice. Sean now specialises in the area of Property, Landlord & Tenant, Wills and Probate to include disputes and litigation that might arise in those areas. Sean attended both primary and secondary school at St. Vincent’s CBS, Glasnevin and later studied History and Economics at Trinity College, Dublin from where he holds an M.A. Degree.